Starting with v4.0, StatTag for Windows has a redesigned user interface. We have an intro video that shows you how it works. StatTag is a free, open-source software plug-in for conducting reproducible research. It facilitates the creation of dynamic documents using Microsoft Word documents and statistical software, such as Stata. Users can use StatTag to embed statistical output (estimates, tables and figures) into a Word document and then with one click individually or collectively update output with a call to the statistical program. 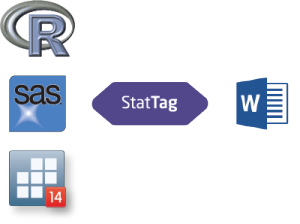 What makes StatTag different from other tools for creating dynamic documents is that it allows for statistical code to be edited directly from Microsoft Word. Using StatTag means that modifications to a dataset or analysis no longer require transcribing or re-copying results into a manuscript or table.